A limited time offer. Call us today. Starting as low as $199 professionally installed! Markey Home Remodeling window replacement sale prices are unbeatable. Our prices are between $50 to $250 less per window than our competitors. 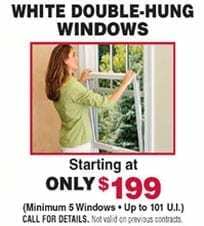 We can keep our prices low because we purchase windows in large quantities, we get a volume discount. We also hav low advertising costs because the majority of our sales come through referrals from our thousands of satisfied customers. When selecting new replacement window we don’t just show you our window replacement options, we show other windows available on the market. We actually demonstrate the features that make our windows superior in energy efficiency compared to other windows on the market. We demonstrate the differences in the spacers used between the glass panes. You don’t want to purchase new windows and find that the interior panes are colder in the winter and warmer in the summer than a more energy efficient window for the same amount of money. We demonstrate the difference between the frames. You don’t want to purchase new windows with seams in the frame that allow air to come through. We demonstrate the difference in weather stripping. The weather stripping on some windows is cut short allowing air and the elements to come through. We are rated A+ by the Better Business Bureau and Angie’s List, and have been in business since 1981. We use our own certified employees to install your windows, no subcontractors, and we have a showroom with all full size products on display. Our service area includes Bridgewater NJ, Branchburg NJ, Hillsborough NJ, Somerset NJ, Flemington NJ, Basking Ridge NJ, Bedminster NJ, Montgomery NJ, Belle Mead NJ, Readington NJ and surrounding areas.